His Beatitude Archbishop Chrysostomos II (Demetriou) of Nea Justiniana and All Cyprus (Greek: Χρυσόστομος Β΄) is the current Archbishop of the Church of Cyprus. Born Herodotos Demetriou on April 10, 1941 in the village of Tala, near Paphos, in southern Cyprus, he lost his father at the age of ten. After completing his elementary school education two years later, he became a novice at the Monastery of St. Neophytos. Continuing his education, he graduated from the gymnasium in the city of Paphos in 1963. On November 3, 1963, he was ordained to the diaconate by Bp. Georgios of Trimithounda. For the next five years he was a trustee of the monastery while also working on a ranch. In 1968, he began studies in the Theology Faculty of the University of Athens, graduating in 1972. On October 19,1972, he was elected hegumen of the Monastery of St. Neophytos. He was then ordained a presbyter on November 12, 1972 before being elevated to hegumen by Abp. Makarios III. On February, 1978, Hegumen Chrysostomos was elected Metropolitan of Paphos and was consecrated the following day, February 26. Following the retirement of Abp. Chrysostomos I (Kykkiotis) in 2006 due to Alzheimer's disease, Metr. 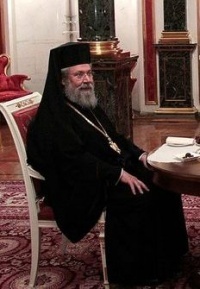 Chrysostomos was named locum tenens until his election as Archbishop of Nea Justiniana and Primate of the Church of Cyprus on November 5, 2006. He was enthroned a week later on November 12 at St Nicholas Cathedral in Nicosia. In April 2006, Abp. Chrysostomos was outspoken against the plan by the United Nations for reunification of the two parts of Cyprus, a plan that was later defeated in a popular vote. This page was last edited on February 25, 2012, at 14:07. This page has been accessed 18,230 times.